Our previous workshop on building an automatic boat dock went really well. A lot of Minecrafters showed up and everyone got right to work on their own versions of the boat docking station. Even those players new to redstone gave it a shot and did great! There are so many ways to incorporate this tutorial into different dock versions, so if you have any ideas, I'd love to see them. Please post to our community corkboard to share with us. The full tutorial is shown in the below video, so feel free to check that out, or simply follow the step-by-step written tutorial after! But don't miss out on watching how fast the boat launches! 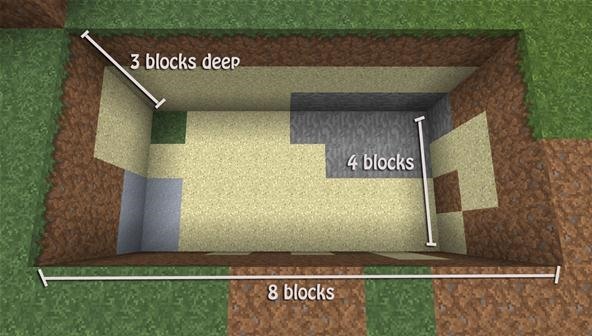 Start with a hole that's 8 blocks wide, 4 blocks tall and about 3 blocks deep. Depending on how new you are to redstone, you may want to start a couple blocks back from your lake. Don't worry if you want to start a little farther back from water than I did. 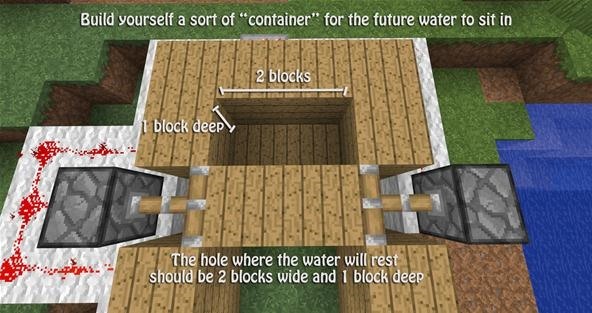 All you simply need to do at the end of the tutorial is dig out the extra earth between your dock and the water, and replace those blocks with water! 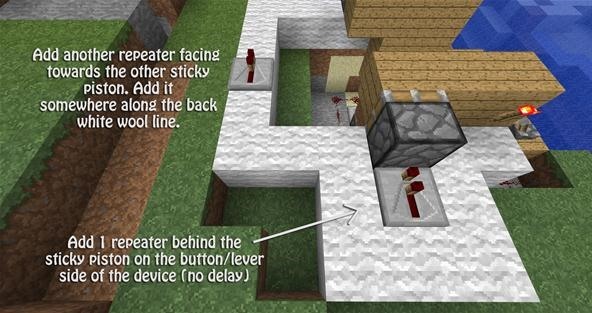 If water accidentally gets into your wiring, it will destroy all of the redstone. So keep this in mind! Standing in the front of your 8x4 hole, you will want to place 4 sticky pistons at the bottom level. 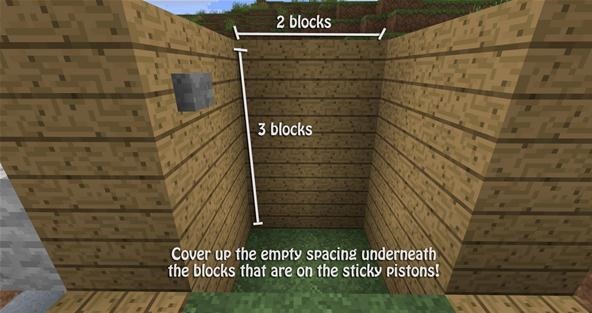 Your sticky pistons should be about 2 blocks from the right wall. Facing your sticky pistons on the side, place a repeater on the side of each sticky piston. Keep in mind that the repeaters should be facing inward, and the repeaters do not need any sort of delay on them. 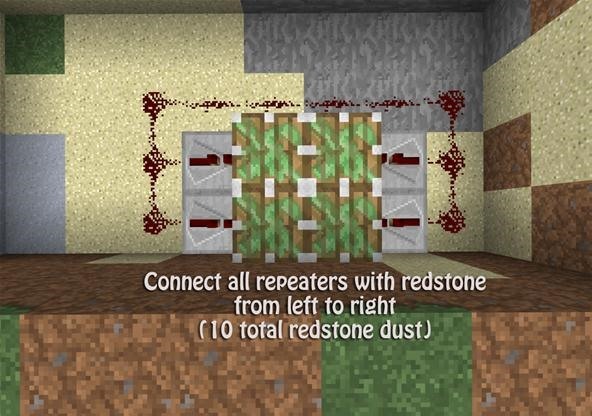 Connect all of the repeaters with redstone dust. 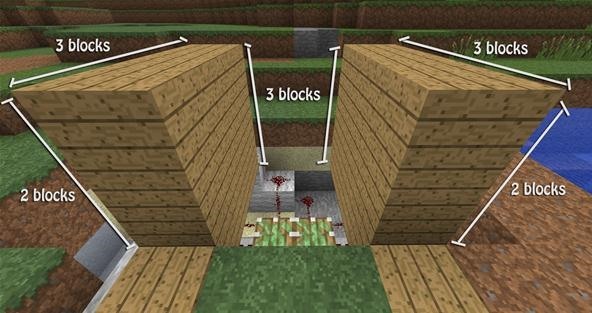 You should use a total of 10 redstone dust for this part. Begin preparing for more wiring. 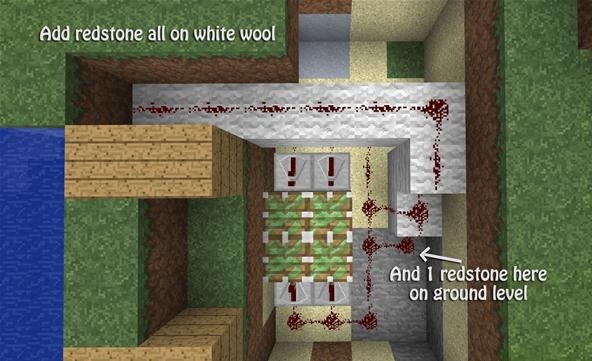 I like to use white wool to mark where my redstone will go, but you can use any material for this part. 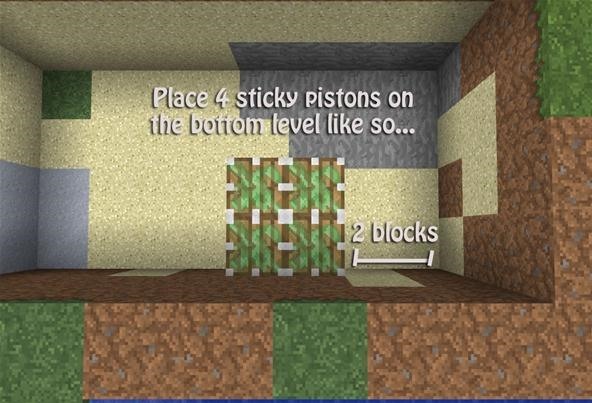 Standing at the front of your layout, you will begin placing your choice material directly behind the left sticky piston. Of course, there is redstone there, so place your material behind that redstone. Two total blocks will be placed on the ground level, then you will do a stair to the next level. You will end up with a sort of "Z." It will only take up 3 blocks in length, and it will be 2 blocks tall. Continuing off of your "Z," you will now place another 6 blocks leading towards the front of your device. You should still be 1 block below ocean level (y: 63). 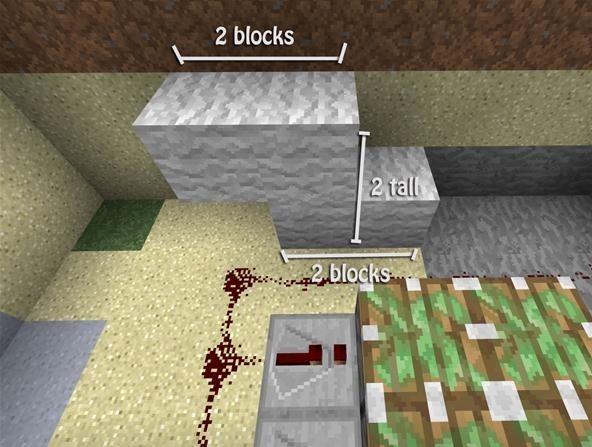 Place redstone all along the blocks you just placed, connecting it to the redstone on the ground level. For safe measure, I like to add one extra redstone dust to the right of the beginning of our stair. 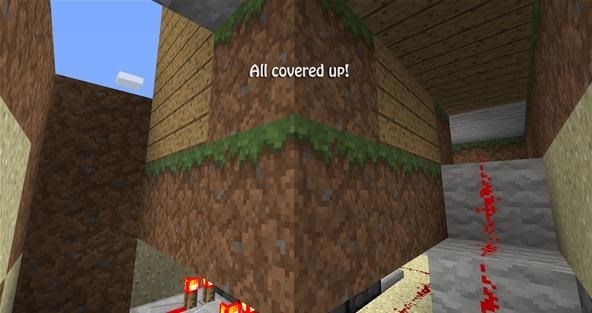 I do this because I like to cover up the redstone later to prevent mishaps with the water. Later on, if we do not have this extra piece of redstone down, we will have to place the extra one anyways after we cover up the sides of the sticky pistons. Cover the tops of the sticky pistons with a material of your choice. I chose grass, but if you're not in creative mode, feel free to use whatever you like! On the top of the sticky pistons, on that level, it should be 3 blocks wide. The third row of blocks should extend towards the front of your device. Be sure to block off any water so that it doesn't ruin your wiring! To the left and right of the platform (row of blocks on top of sticky pistons), I placed wooden planks. These wooden planks are inside the wall of our initial layout, and are 2 blocks long (they stick out into the water in the front). These wooden planks will be useful in the forthcoming steps, and we will be using them as guides. I chose wooden planks for this part because when I think of a boat dock, I picture wooden planks being somewhere! Use the wooden planks that we placed in Step 7 as a guideline. Directly behind those wooden planks, going towards the back of the device, we will be placing more planks. These wooden planks will be our "walls" of sorts. These walls will be a total of 3 blocks long, and 3 blocks tall. The tricky part is that from the front, it will appear as if it's only 2 blocks tall because the 3rd layer is underneath. You will now want to place a button. If you are in the front of your dock, look to the left and place a button at the top left of the wall we just created. Your lever will go on the left as well, and will be on the furthermost wooden plank on the ground (ocean level). Flip the lever and make sure your platform works! On the opposite side of the button we just placed, place a redstone torch. This isn't connected to anything just yet, but we're getting there! For this step, I used white wool again. You can use any material you prefer, so don't freak out if you already ran out of wool! 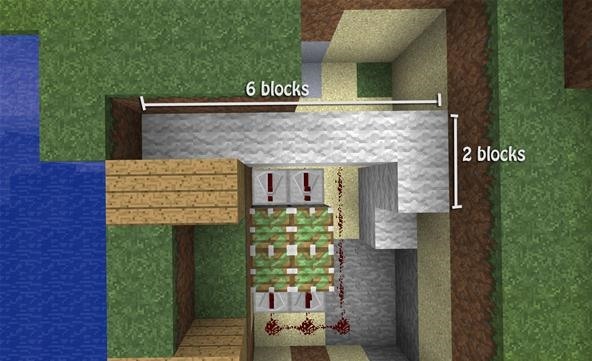 Starting from the side where the redstone torch is, place your first block directly below the redstone torch. This beginning line will be 6 blocks long, heading towards the back of your dock. Continuing off the back of the line you just created, start making your way around to the other side. The back wall of blocks will be 6 blocks long, as well. One block away from the redstone torch, this will be the beginning of a 3x3 square that is only one block tall. Standing in the front of your dock, you will need to place sticky pistons on the lines we just placed in Step 10. These sticky pistons should be 1 block behind the wooden planks, and they should be resting on the white wool. 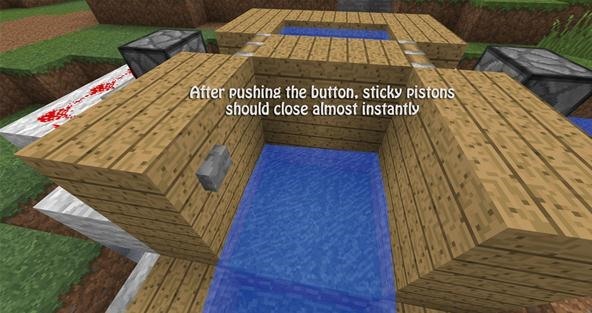 After you're done placing the sticky pistons, place a wooden plank directly in front of each of them. 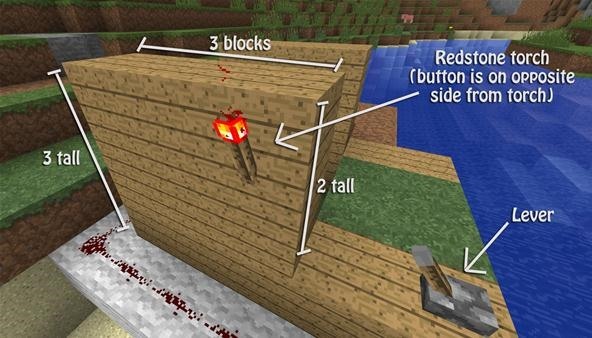 On the left of your dock (the side with the redstone torch), you will place a repeater directly behind the sticky piston. 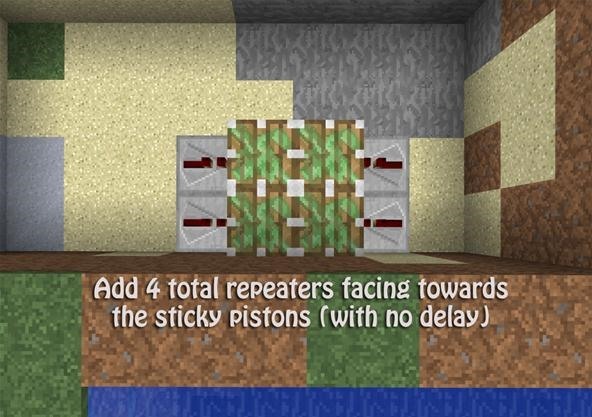 On the back line, you will need to place another repeater facing towards the opposite sticky piston. Our redstone torch is our power supply, so we need to ensure our power is going the right way. 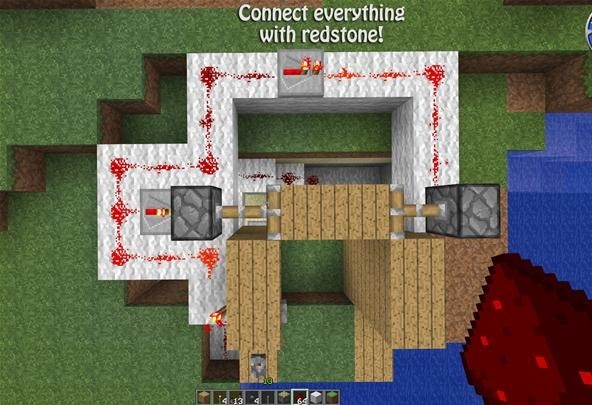 The redstone torch will first send power to the left repeater to power the sticky piston. In return, it will then will go around the back, through the repeater, and to the opposite sticky piston! Step 13 Last of the Redstone... Woohoo! 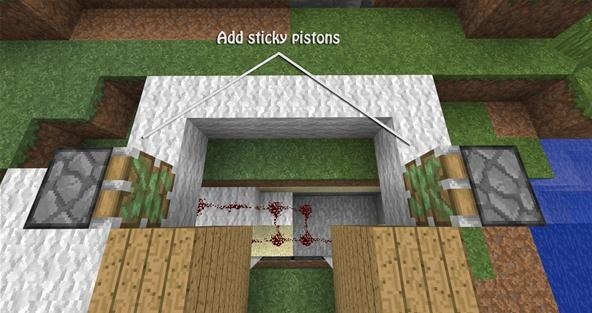 Connect everything from the redstone torch to the right sticky piston with redstone dust. 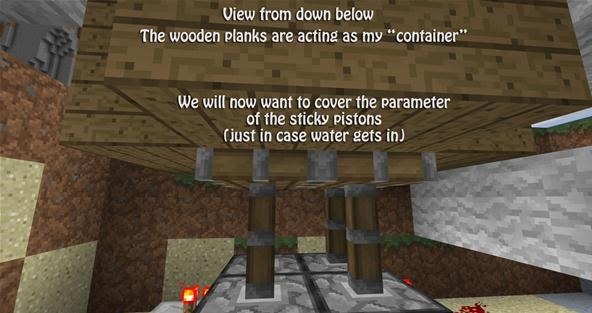 Your two sticky pistons should now be powered in the "on" position, forcing the wooden planks to meet. Begin this step by layering down underneath those two wooden planks. You will want to make sure that your platform is down, so that no water can seep through the bottom! This is the toughest step of all, so take a few deep breaths before beginning. Flip your lever again and make sure it is in the raised position. Now just make a sort of "container" for your water to rest in. 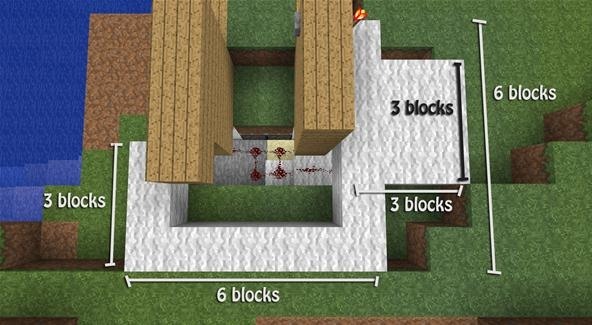 Your container should be two blocks wide and only one block deep. Don't forget to add a bottom! Head on down below where your sticky pistons are. 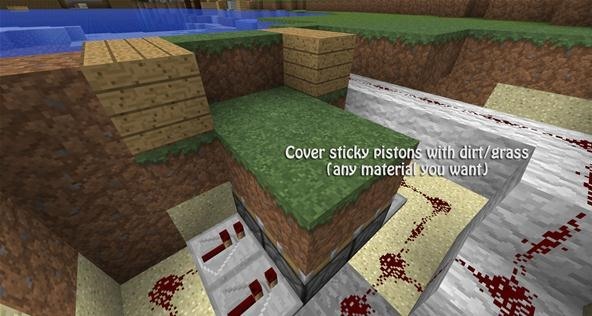 Cover all of the edges of your sticky pistons with dirt (any material will do). This will ensure extra safety when other people are using your boat dock. If someone accidentally breaks a block instead of the boat, water won't flood your wiring. Now, place about 4 blocks of water. Begin by filling your container at the top. You will use two water buckets to fill your container. Depending on how far back from water you started to make your dock, you may need to break more blocks than I did. 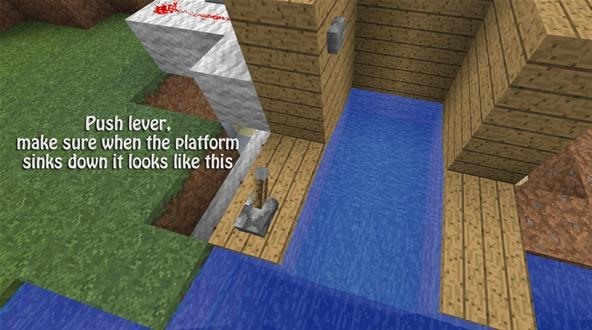 Of course, breaking more blocks means placing more water. 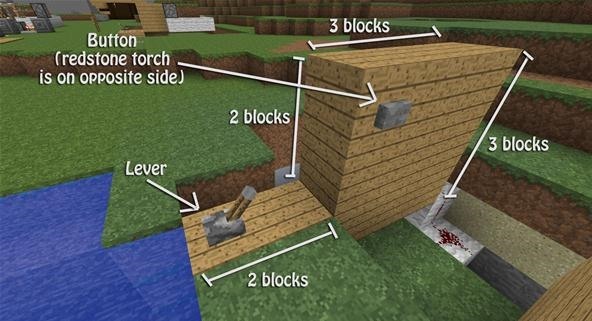 In the front of your dock, there should be a 2x2 water source (no water flow) in-between the wooden planks. 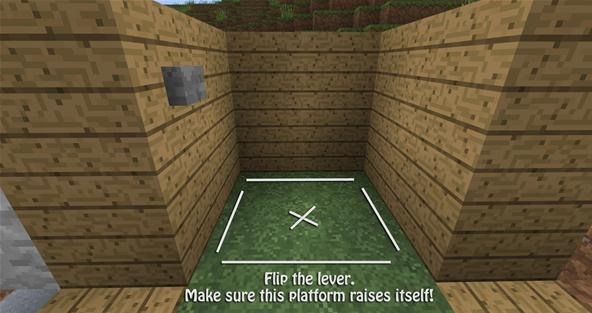 Flip your lever again and make sure when your platform lowers, the water flows onto the platform. This lever is meant to be used for when someone is returning to the boat dock with their boat. The water flow gives them a little push onto the platform. When they're against the wall, they can hit the lever again to raise the platform and leave the dock. Step 20 Check Your Button! Now you just need to make sure that your button works. Before pushing the button, make sure your platform is raised. This button is in place so that when people are looking to leave the dock, they sit in their boat on the platform. They then hit the boat while holding the "W" key on their keyboard, and it will shoot them into the ocean! The pistons have no delay on them, which means the pistons will open and close quickly. TehGeekFather created this awesome boat dock during the Weekly Workshop, and I really wanted to show it off! He used the same technique I did, but the result is very different. I absolutely love his version, maybe we can convince him to post a tutorial?! Have you ever created a boat dock? Did it involve redstone at all? 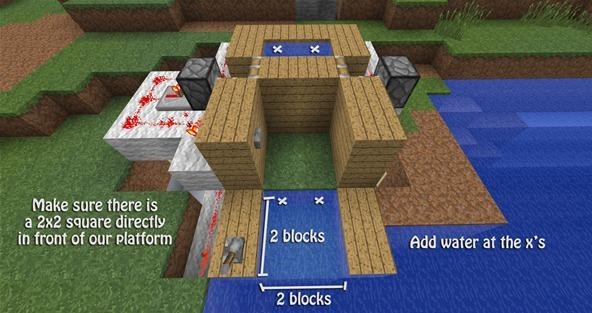 How will you be incorporating this tutorial in your future builds? What kind of tutorials/tip-related posts would you like to see in the future? The new Weekly Workshop will be be announced tomorrow, so be sure to check back to see what we'll be covering next! If you have a suggestion for this week's and/or next week's workshop, leave a comment below. We'd love to hear your ideas! We use TeamSpeak3 for our workshop tutorials; you can download it free here. How far out (in blocks) will the boat launcher send out your boat at a hyper speed before it slows down or stops?